Isobar’s office in India was transformed into an adrenaline-fuelled zone for 24 hours when it hosted Isobar’s latest Hackathon. Tech experts flexed their ideas and concepts to develop innovative solutions to the client’s problems. Teams demonstrated their inventive capabilities using voice-enabled technology, augmented reality, virtual reality, voice and machine learning. Innovation sprints, like this hackathon, allow us to bring the best ideas from our teams to life, helping our clients take advantage of innovative technology to drive revenue growth and remain leaders in their domain. Our Hackathons involve people across all disciplines and aim to create leading edge solutions to client’s problems. Previous Hackathons have created new customer experiences using voice technology and virtual reality. Nine teams, comprising 36 people took part in the Hackathon which was centred around the theme of innovation. Developers could choose any technology of their choice. The solutions were evaluated based on the quality of problem statement, the innovation behind its conception, the completeness and long-term resourcefulness of the solution. Mentors were available round the clock to help the teams with their ideas. During 24-hours of intense hacking, the teams fought closely for the winner’s trophy. Unique and creative ideas were presented, bringing innovative concepts to life. Out of all the awesome ideas presented, 2 teams were selected as winners by our judges and employees respectively. Customers are demanding more from their in-store experience and this Isobar Hackathon solution by Team Maneki-neko raised the bar. This Augmented Reality experience enables retailers to engage their customers in physical stores. Customers can use their mobile devices to locate virtual characters which appear on specific products or at specific areas in the store. Voice is being increasingly used to create frictionless transactions and Team Mystic delivered a great Hackathon solution. Their voice-based interactive online beauty consultant helps cosmetic brands attract and engage consumers by offering them personalised recommendations. The voice consultation asks the customer questions about their age, skin tone, skin type and skin concern. Customers then upload their photo and the system analyses the image. Based on the analysis, customers get personalized product recommendations. Commercialising voice-enabled technology for retailers and brands is key to long-term success. Watch and experience highlights from the hackathon here. Isobar Commerce India is part of Isobar UK, as well as part of Isobar’s Global Commerce Practice, which is made up of more than 1,000 commerce specialists from Isobar’s global network. 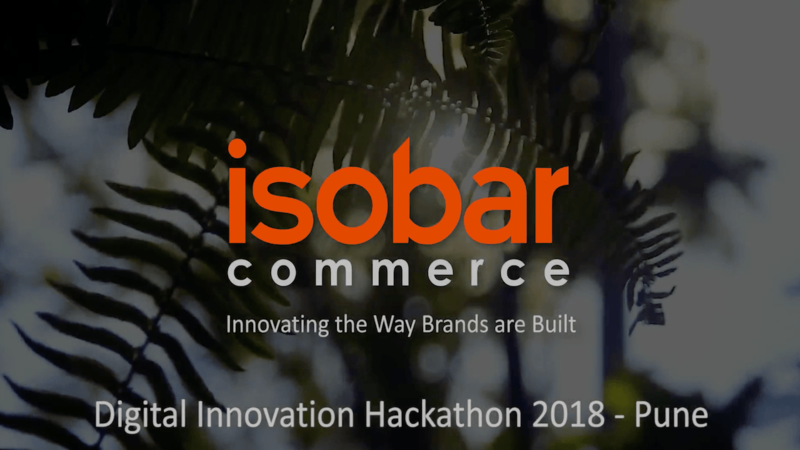 To find out more about our Hackathons or how we use ecommerce solutions to help brands and businesses stay competitive, contact us at HelloIsobarUK@isobar.com.